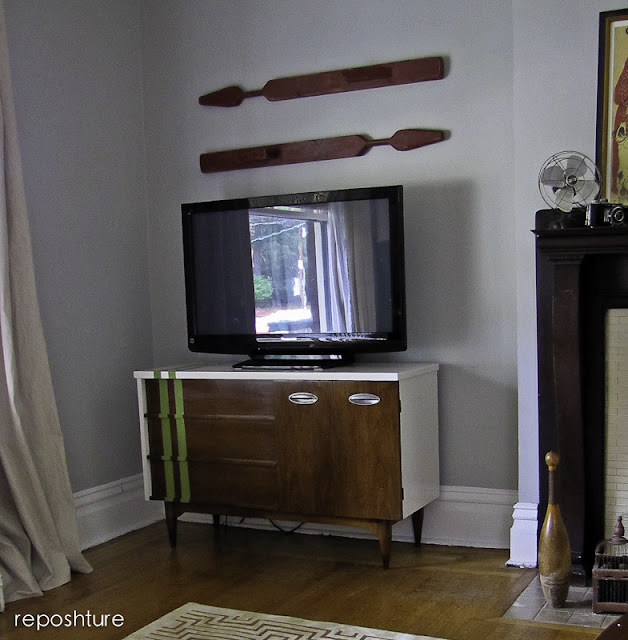 Reposhture Studio: Mid-Century Monkey Tape Buffet TV stand.......you'll understand once you read the post! Mid-Century Monkey Tape Buffet TV stand.......you'll understand once you read the post! A home takes time and money to build. It does not happen over night. 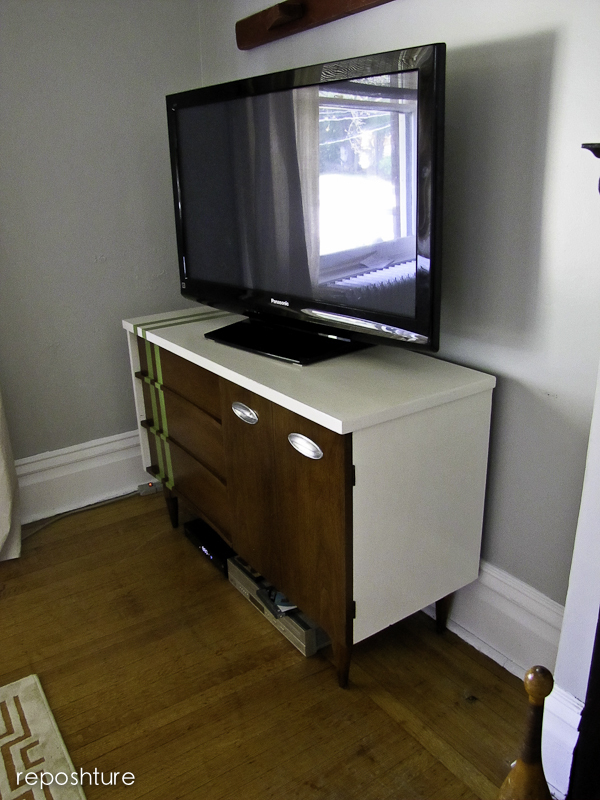 For example, I have been living with a TV stand that was a mash up of a $5 yard sale book shelf and a free from the trash Pantry door for about a year and a half. See it in the right corner there? Pure beauty I tell ya'. 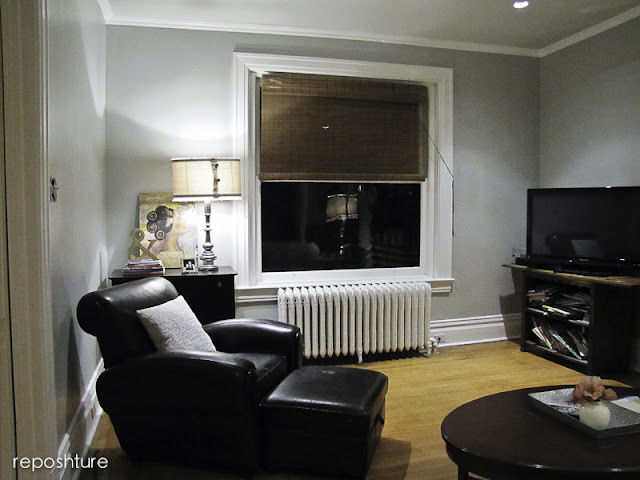 Previously it hung out on the black hutch on the right for 6 years. It was making the rounds on my different pieces of furniture while I waited to find the right dresser, console, etc. that I could put my personal touch on and wasn't too much money. I was having no luck in my thrifting sprees. I complain A LOT about how crazy people are when they throw something great out but in reality...I am actually somewhat thankful. 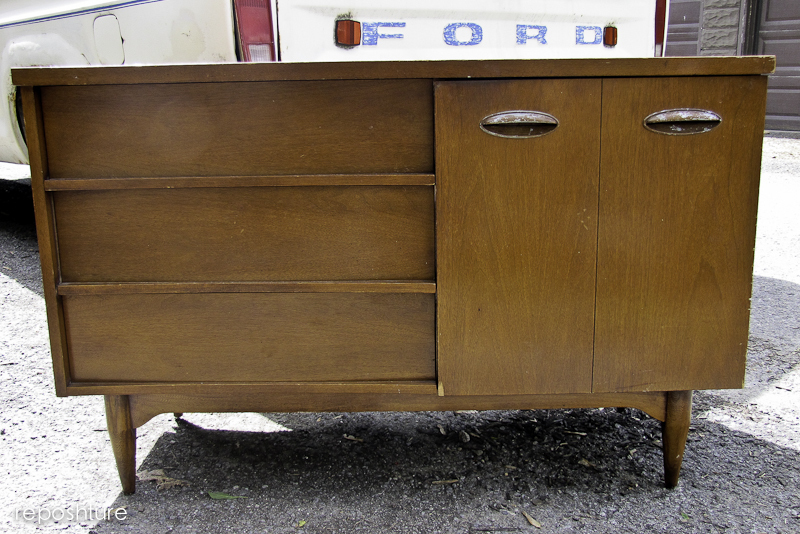 I hope people continue to throw out great furniture. Otherwise how else would I have found this baby! Actually, I am not the one who found this... my middle little is the one who spotted this from the car. She obviously comes from good pedigree. She knows great lines when she sees them. After all, she gets up close and personal with my crows feet on a daily basis and still thinks I'm beautiful. Kids are great for your ego. Crows feet not so much but whatever, I earned them right! So here she is fresh off of the trash. These handles were actually painted in a "faux" wood grain. Can't make sense of that one. Now where does the Monkey Tape come in? 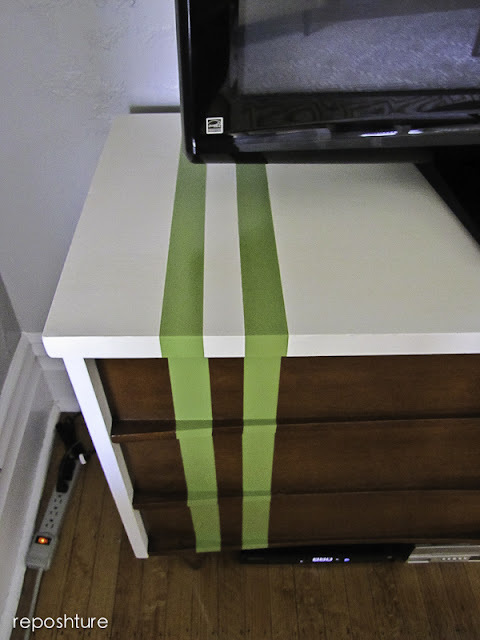 I had used green FROG tape to tape off my lines so I could paint green stripes on the console. Here she is all painted up. 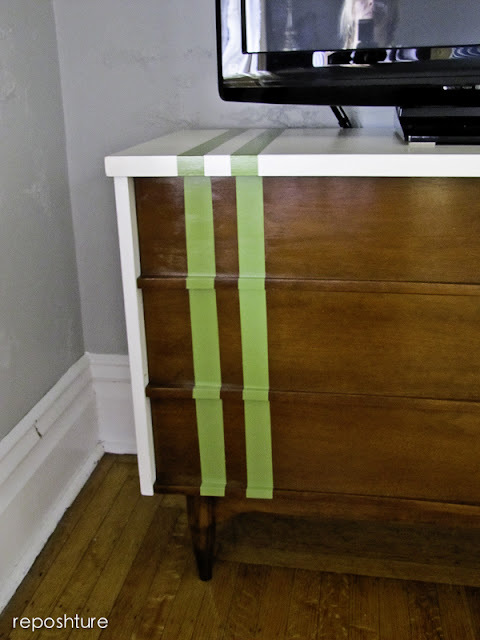 As it turns out, the green paint is the almost exact same color as the Frog Tape and when middle little, IzzyB, saw the console she said "why didn't you take off the monkey tape?" Why green? I thought I would give it a nod to those great greens from the 50's. Just a touch to not make it too kitschy. And I like color so a little bit of green never hurts. 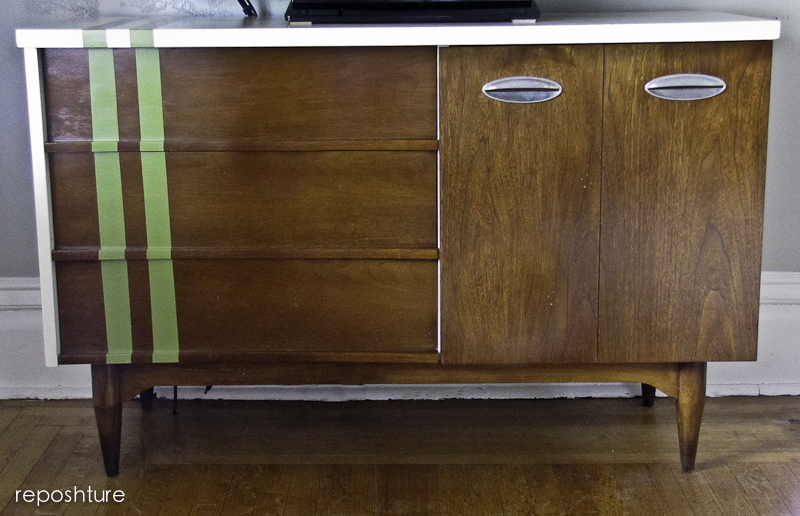 It was tough going getting these stripes straight as the front of the drawers are curved inward. When you are up close it looks like you are way off but then you have to move back and look at the lines again and they look much straighter. This drawer front got completely sanded down twice because I grabbed the wrong color stain the first time. Thank goodness for palm sanders and thick veneer. Did you see that the hardware is now spiffed up? 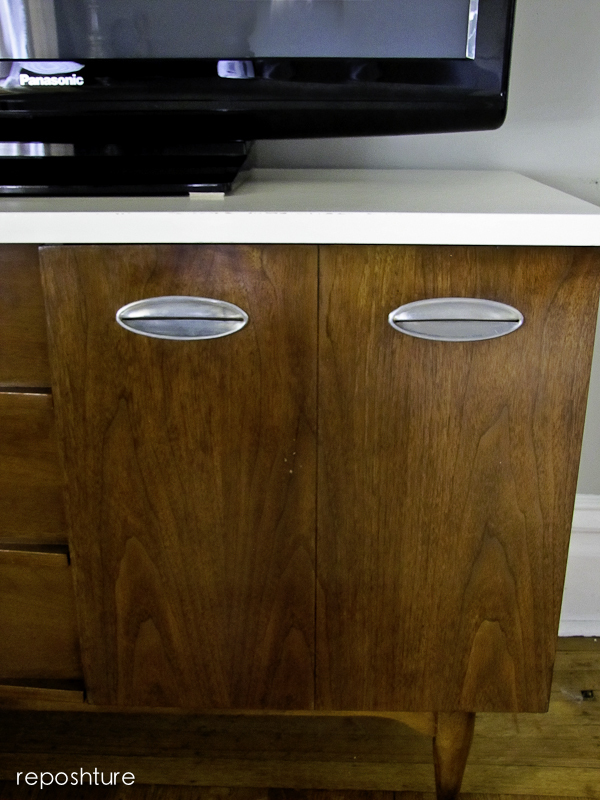 Just a little mineral spirits and steel wool did the trick to remove the wood grain. I wish it were that easy on all my projects. At least it gives me an upper arm workout and keeps the bat wings at bay. You know what I'm talkin' bout?!? I love the white against the wood and green definitely gives my love of orange a run for its money. So far everyone who has seen it loves the green stripes too. And this is the reality shot because if you look at the first few pics you will notice that there is no cable box or DVD player in them and the scads of cords are nicely tucked up behind the console. I take those pictures just so the piece can get it's due.But that is not how our life is. We have cords dang near everywhere. This is also a reality check that patience can net you some awesome finds that will help you build a home that is about you and reflects you (even in the TV screen??). Get the word out, let people know what you need, look on the trash even if it makes you uncomforatble at first (the first step outside the car to grab someone's trash is your first step towards creative liberation! ), go to thrift stores often. Look at the lines and form not the color. You can paint anything. 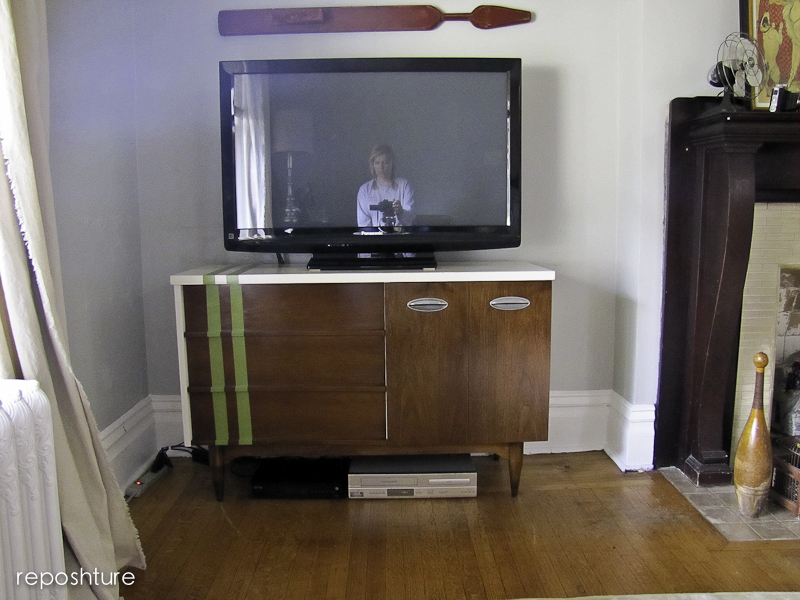 7.5 years for a TV stand. Yes, and it was totally worth it. Love that your daughter spotted this- my son - 29 - still grabs things he thinks I'll like!!! Great lines indeed! Your stripes are perfect - not too much, just right. That little one deserves a special treat, I think! I like the green strips. It looks great!